LtoR: Bernie Rowland, Principal Davitt College, Cllr Blackie Gavin, Chairman Castlebar Municipal District, Finian Joyce making Presentation to Tanya Fisher-Lehmann (Teacher). Paddy Mahon Director of Services, Nora Coyne Castlebar Municipal District, Maura Carey Teacher Davitt College, Werner Barnreutter (Teacher). Photo © Tom Campbell. The Chairman and Members of Castlebar Municipal District accorded a Civic Reception to Students and Teachers from Realschule, Hochstadt Germany (Castlebar’s twin town) at a function at Lough Lannagh Holiday Village. Lto L Cllr Michael Kilcoyne, Finian Joyce, Martin McLoughlan Co-opted Mayo County Council and Castlebar Municipal District, Joanne Walshe Castlebar Municipal District, Nora Coyne, Castlebar Municipal District, Cllr Blackie Gavin, Chairman Castlebar Municipal District, Bernie Rowland, Principal Davitt College, Tanya Fisher-Lehmann and Werner Barnreutter (Teachers,) Maria Carey teacher Davitt College, Cllrs Threse Ruane and Henery Kenny, Paddy Mahon, Director of Services. Also Students from Davitt College. Photo © Tom Campbell. 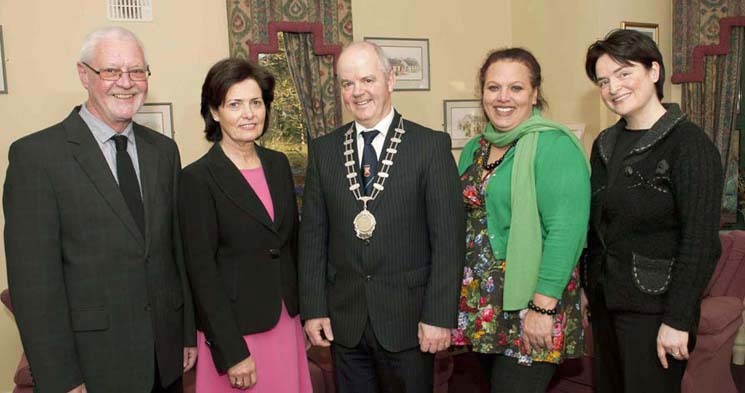 LtoR: R Werner Barnreutter (Teacher), Bernie Rowland Principal Davitt College, Cllr Blackie Gavin Chairman Castlebar Municipal District Tanya Fisher (Teacher), Maria Carey, Teacher Davitt College. Photo © Tom Campbell.